Choose Window > ScoreManager (or press COMMAND+K). The ScoreManager is a realizable floating window that allows you to view, edit, reorder, and delete score Instruments, including mid-score instrument changes. This includes the ability to change staff settings, including the first clef, transposition, notation style (percussion/tablature), and others. The ScoreManager also allows you to assign Audio Units and MIDI sounds. These staff and sound assignment options are available under the Instrument List tab. The several columns of the ScoreManager also allow you to adjust mixer settings (mute/solo/pan) and assign (Audio Units or MIDI) sounds to Instruments. These settings can be assigned to Instrument's layers, chords, expressions, and mid-score instrument changes. Use the popup menu to select the available columns. See Instruments for more details regarding how to manage Finale's Instruments in the ScoreManager. Note. The available columns change depending on whether you are using MIDI or Audio Units for playback. Instrument. This column lists the Instruments in the same order displayed in the score. This identifier corresponds to Finale's internal list of Instruments, and usually matches the Name (although it isn't required to). Click the arrows to the right of the slot to open a popup menu, which you can use to change the Instrument at any time. When opening a file created in an earlier Finale-family notation product, (like Finale 2011), you will see "Unknown" listed in this column if Finale was not able to identify the instrument using the staff attributes of the old file. (You can click the adjacent arrows to assign the "Unknown" instrument to one of Finale's integrated Instruments, with standard clef, transposition, and other attributes.) If you change to an instrument of a different register (e.g. flute to tuba), existing notes will be transposed into the range of the new instrument (or as close as possible). See Ranges. Device. This column lists the playback device for each Instrument. If you are playing through Audio Units, this column lists the Sound Map or Audio Units player. If you are playing through MIDI, this column lists the MIDI output device specified for the channel in the MIDI Setup dialog box. Sound. This column lists the playback sound, when available. If you are playing through Audio Units and a Sound Map is selected for the Device, this column lists the name of the sound sample in the selected Sound Map. (If you are using a 3rd party Audio Units sound library, "Edit Player" appears, which you can click to reference and change the sound set to the specified Finale channel. See To assign 3rd party Audio Units sounds to instruments.) If you are playing Finale through MIDI, this column displays the General MIDI instrument (or equivalent). You can click the popup arrow and choose from the complete list of General MIDI sounds. Click the popup arrow and choose Edit Patch to open the Set Patch To dialog box where you can assign Program data for playback through an external MIDI device. See To establish MIDI sound settings for a score Instrument. If a device uses midnam files, the Sound popup menu will display banks and sounds for the device associated with the midnam file. To use midnam files, see Configuring a new device in Audio MIDI Setup. If SmartMusic SoftSynth is selected, to select percussion, choose "MakeMusic GM : Bank 128." (See also Percussion MIDI Maps: SmartMusic SoftSynth). Bank. The Bank column is available when playing back through Audio Units. The number listed here is the bank assigned to the device in the Audio Units Banks and Effects dialog box. Click to reveal a menu including all the banks that use the same device. Finale assumes 16 channels per bank when assigning sounds automatically, but you can make manual adjustments as required (if, for example, a particular device has less or more channels per bank, or if you do not wish to use all available channels in a bank and instead start a new bank). To load a player on a new bank, click this column and choose Next Available. Doing so loads the Sound Map or Device into the new bank in the Audio Units Banks and Effects dialog box. Ch. When playing back through Audio Units, this column indicates the channel used by the instrument (or layer) in the selected device accessible through the Audio Units Banks and Effects dialog box. When playing back through MIDI, this column displays the MIDI channel assignment for each staff (or layer), from 1 to 64 (or 32, if your MIDI interface is a 32 bit card). To change this number, double-click, and type a new channel. If you’ve assigned several staves to the same Instrument, by the way, remember that they’re all linked to the same MIDI channel. Therefore, if you edit the Ch. assignment for any one of these staves, the Chan. for all of them will change to match, because any given Instrument can only have one channel assignment. Percussion MIDI Map. From this popup menu, choose the desired Percussion MIDI Map for playback. See Percussion MIDI Maps.
. Click this button to delete Instruments from your Score. Score Order. This popup menu is available when viewing the full score (Document > Edit Part > Score). Use this menu to select a standard score order for your instruments. Instruments in your document will reorder immediately after you select a new Score Order. The Score Order selected in this menu is applied whenever new instruments are added to the document, and changes to “Custom” automatically if you manually adjust the order of your instruments. Customize View. Use this popup menu to select which columns you would like to display in the list of Instruments above. Auto-Number Style 1,2,3.... 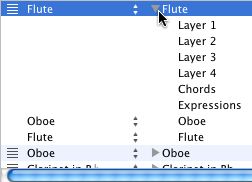 Check this box to automatically number instruments in score sections (Flute 1, Flute 2, etc.). Choose the desired number style from the popup menu.